The couple then hired bikes and cycled along the sea front and across the Golden Gate Bridge, over to Sausalito. “We then bought some yummy ice cream and sat on a bench in a park overlooking the sea. Ross then got down on one knee and asked me to be his wife – it was a huge surprise,” Georgia says. 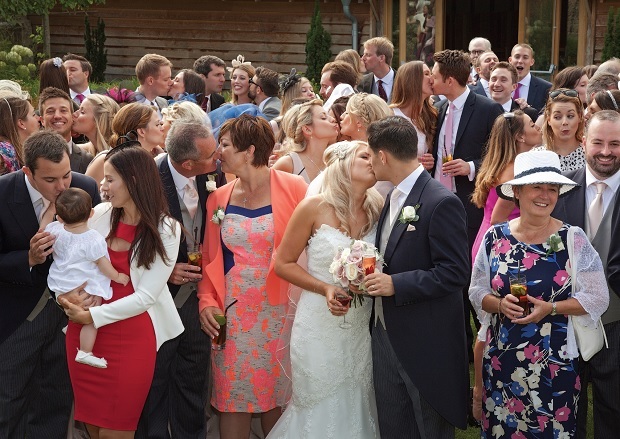 Georgia Baillieu, 26, married Ross Woodham, 31, at St James Church, Birdham, followed by a reception at Southend Barns, Chichester, on 1st August, 2014. I tried on about 30 different dresses from four different shops before I spotted the Pronovias collection in a wedding magazine and adored the designs. I ended up with a simple fishtail gown with button detailing down the back. It was ideal for our summer wedding although I'd initially dismissed it, as it had straps; fortunately, I had them removed and was left with something I loved. 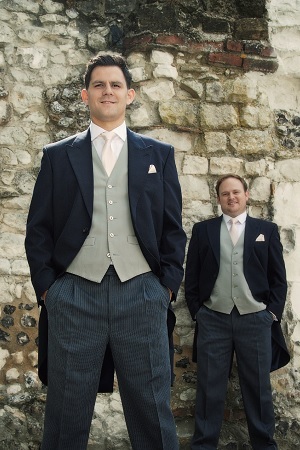 Ross wore navy tails for the day with a grey waistcoat and dusky pink tie and handkerchief that matched his groomsmen's attire. 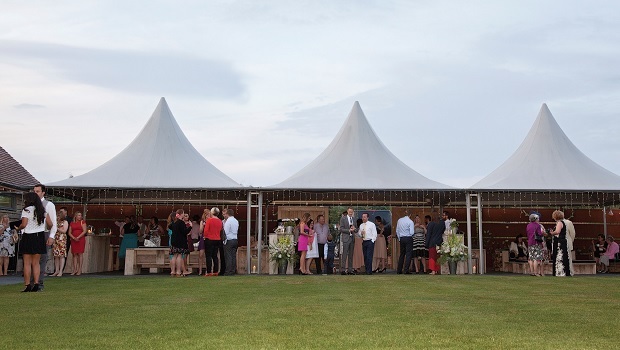 We fell in love with Southend Barns as soon as we saw it. It's faultless, beautiful, has a stylish design and was close to the church. 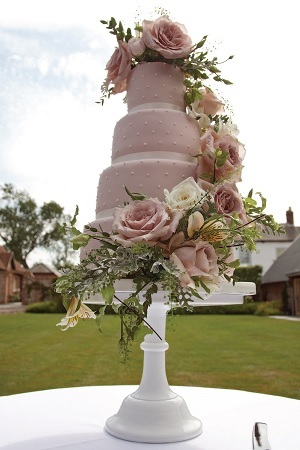 It was our perfect venue and the staff provided a first class service. My dad and my bridesmaids walked me to the church from my house. 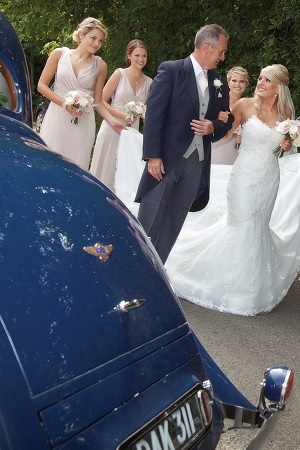 We then hired a vintage car for travelling from the church to the venue, which was a lot of fun. It was great to have five minutes alone together on a very busy day. I really wanted white peonies, but they’re not in season in August so would have been really hard to get hold of. 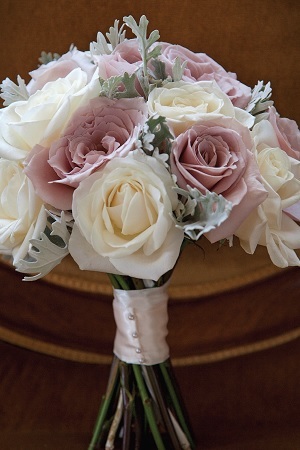 In the end I decided on David Austin pink and white roses, as they look similar, with dusty miller foliage. We decorated the end of the pews with baby’s breath and I was really pleased with the soft, feminine look of all the flowers. Luckily all of my girls were really relaxed about their dresses, so shopping was really easy. We decided on floor-length dusky pink gowns with elegant low backs. They had to be altered slightly to fit but they all looked so pretty on the day. St James is my family church, so I always knew I wanted to get married there. It's beautiful and was an easy decision to make. 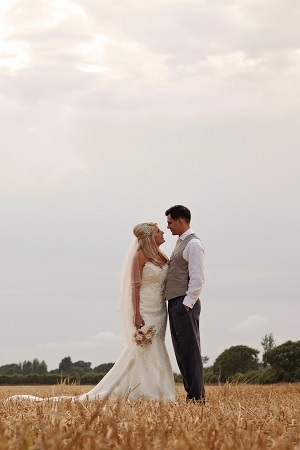 We met our photographer Kelly at Southend Barns' wedding fair and fell in love with her work. 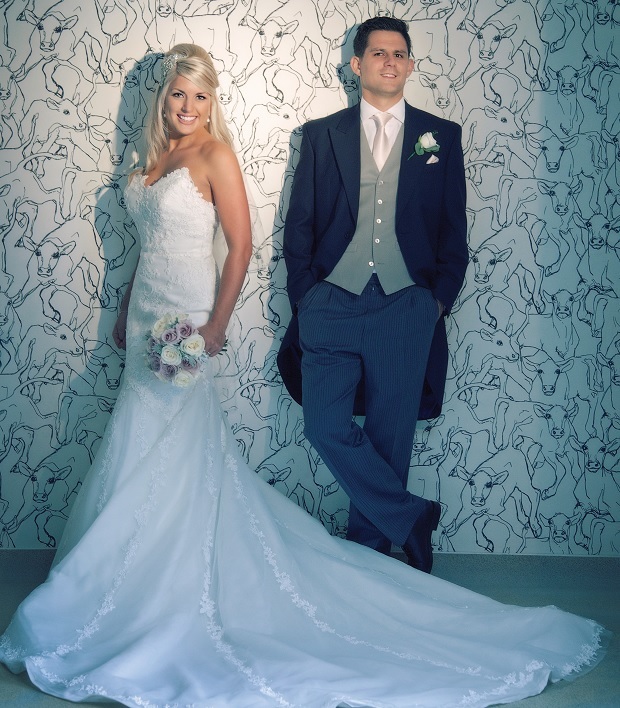 She works closely with all of her couples to create a look they're happy with, and makes every wedding personal – she was a joy to work with and we're thrilled with our photos. 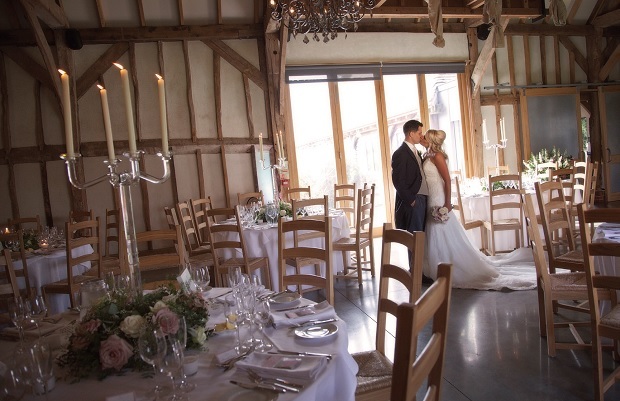 Southend Barns is so stunning we didn't need many decorations and kept the look of our day quite simple. Our cake was a spectacular creation by Tartufi Cakes. I sent Gemma, the cakemaker, a Pantone swatch of the bridesmaids' dresses and she colour-matched it perfectly. We also got our florist to create a swag of our flowers to decorate it. 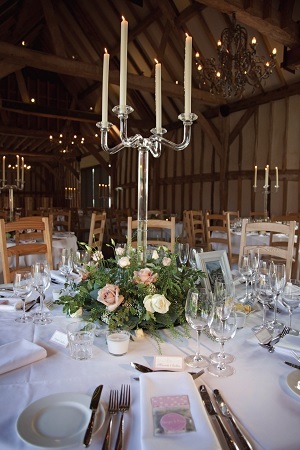 We decorated our tables with tall glass candelabra with flowers featured in my bouquet scattered around the bottom. This looked great with the clean white linen tablecloths. It was great to share our special day with all of our loved ones; it made it feel even more special. 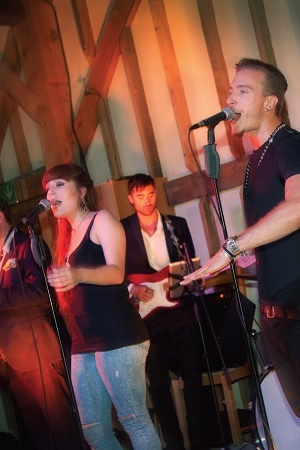 We hired a brilliant live band that played a mixture of classic and new songs, so everyone on the dancefloor was more than happy. We'd definitely recommend it. 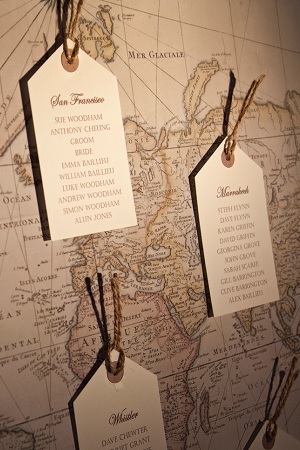 Our table plan was a map and our tables were named after our holiday destinations. Everyone said that our personalities shone through at our wedding. We thought about every detail and chose to focus on our favourite things such as serving cake instead of canapés with Nyetimber fizz before our meal, which went down a treat.